In a move that should surprise no one, BMW reportedly is building a “Gran Coupe” version of the 2-series. For those of you not familiar with BMW’s ridiculous naming scheme, when they add “Gran” in front of “Coupe,” it means two extra doors. This might be their best idea yet. BMW Chief Development Officer Klaus Fröhlich is advocating for a rear-wheel-drive sedan based on the already-popular 2-series coupe and convertible to take on the new compact offerings from Mercedes and Audi, according to Auto Motor und Sport. Unlike the odd niche segment vehicles like the X4 SAV and whatever the hell those GT hatchback things are, a four-door 2-series makes perfect sense. Mercedes sold 26,000 CLA units in 2014 and Audi managed to move over 22,000 A3s last year, according to GoodCarBadCar.net, which tracks auto sales figures. On average, these luxury compact sedans sell at double the rate of the BMW’s 2-series per month. These smaller cars are key opportunities to capture that incredibly lucrative entry level lease market. 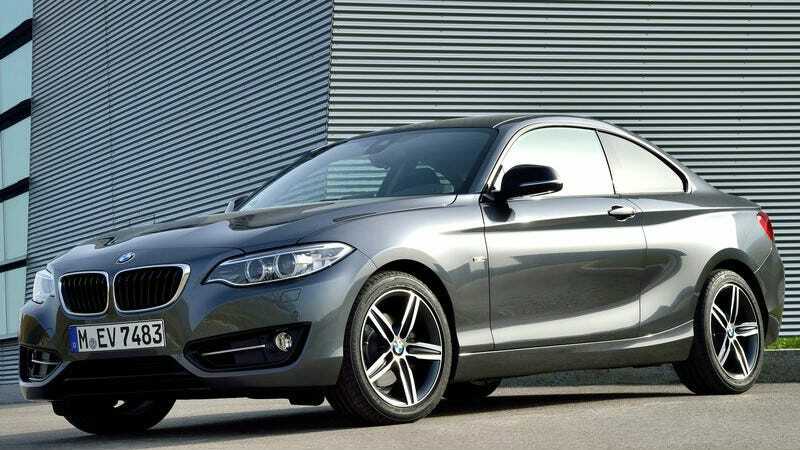 We all know the 2-series is awesome, and its base price of $31,200 makes it accessible for a lot of buyers. Fun fact, BMW actually charges you less for the Gran Coupe version of the 4-series cars. So maybe the 2-series GC would be even more affordable than the 2-door. The only reason why BMW may hold-back a 2-series GC is that pricing might overlap with the 320i that starts at $32,950. However, given the popularity of BMWs in the US, I would imagine there is a business case to be made for both. If the four-door 2-series does happen, it would logically follow that BMW could field an M2 CG to go toe-to-toe with the CLA and the S3. I’ll take my 2-series GC with the ZHP please.